Sayat-Nova (Սայաթ-Նովա, საიათნოვა, Саят-Нова) was an Armenian troubadour poet and musician. He is an important figure in the history of Armenian literature, but he composed songs in all the major languages of the South Caucasus and maintained friendly relations with Georgians and Azeris. For this reason, it has become something of a cliche in writings about the South Caucasus to invoke Sayat-Nova as a symbol of peace and ethnic neighborliness. 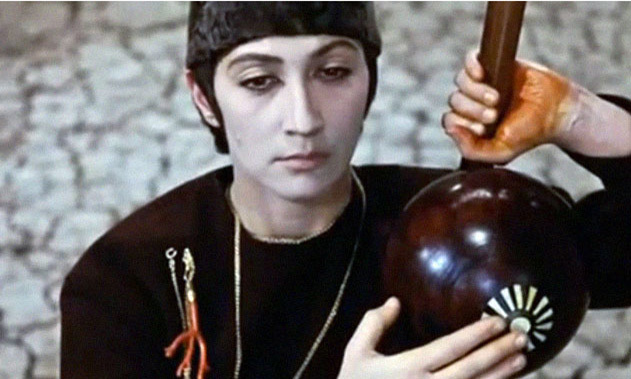 Besides his intrinsic importance, Sayat-Nova was also the quasi-subject of Sergei Parajanov’s brilliant film The Color of Pomegranates. When Jesus was crucified, so the story goes, Pontius Pilate affixed a sign to the cross which read “JESUS OF NAZARETH THE KING OF THE JEWS” . On most crucifixes, this mocking title is represented by initials on a sign over Jesus’s head. 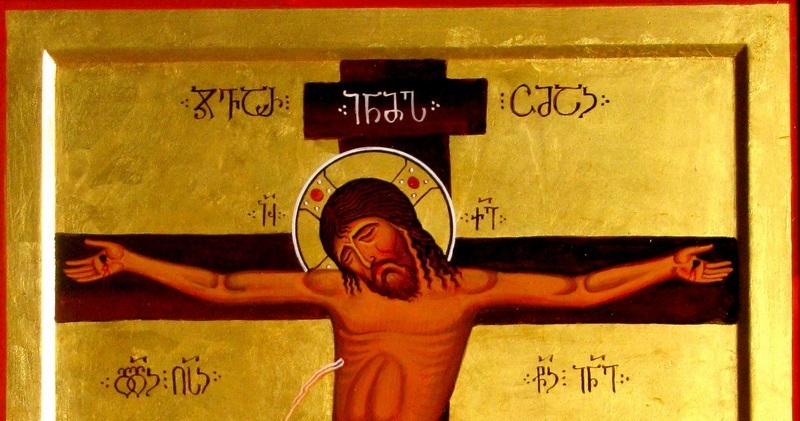 On Catholic crucifixes, the sign says INRI, short for the Latin Iesus Nazarenus Rex Iudaeorum; on most Orthodox crucifixes, the sign says ΙΝΒΙ, short for the Greek Iesous ho Nazoraios ho Basileus ton Ioudaion (Ἰησοῦς ὁ Ναζωραῖος ὁ Bασιλεὺς τῶν Ἰουδαίων). 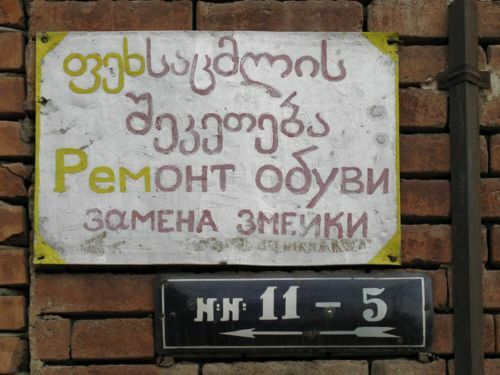 Georgians, on the other hand, use their own language: ႨႬႫჀ (INMH), for Iesu Nazareveli Meupey Huriatay (იესუ ნაზარეველი მეუფჱ ჰურიათაჲ). XO: Very good, Mr. Bond. You’ve been to Russia? JB: Not recently. I used to drop in occasionally. Shoot in and out. In fact, Xenia’s accent is not Georgian, but Russian (see video below). As I’ve discussed before, Georgian accents are fairly plodding, whereas Russian accents tend to be smooth and liquid. Probably the screenwriters chose to add this detail in order to avoid the Russian villain cliche while still keeping the story within the post-Soviet world. It also has the added benefit of signaling to the audience that Bond is worldly (“Wow, he can pick out an obscure accent, that’s some real secret agent stuff!”). The Mingrelians (Mingrelian: Margalepi; Georgian: Megrelebi) are a Kartvelian people who live in northwest Georgia, in the region of Mingrelia (Mingrelian: Samargalo; Georgian: Samegrelo). Sounds innocuous, right? It’s not. 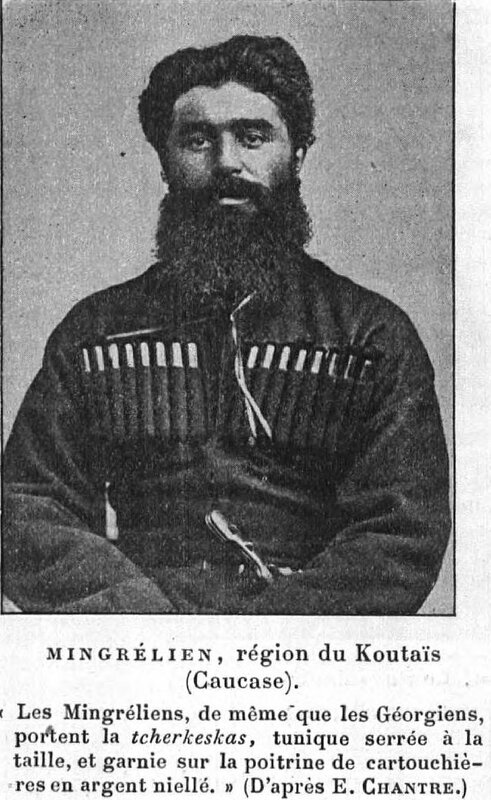 The claim that Mingrelians constitute a “people” would be considered seditious by many Georgians, since it suggests that Mingrelians are not, in fact, Georgians. This, in turn, might lead one to suppose that Mingrelians ought to have their own independent state. That would be a big problem for Georgians, so they claim Mingrelians as their own.